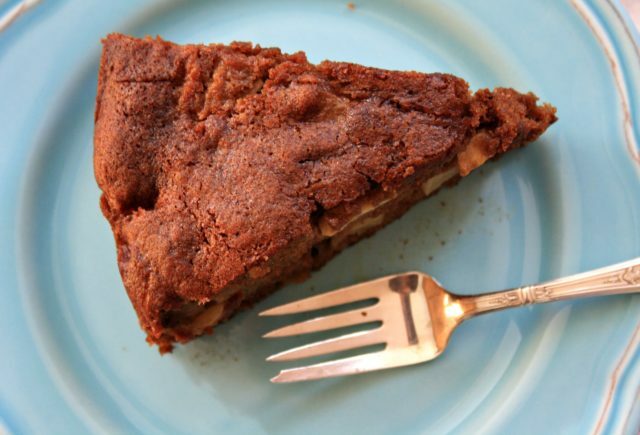 This is the recipe that began my love affair with gingerbread. My mom discovered it the year I was born and I have been eating it ever since. To this day I have never found a gingerbread recipe that I love more. The recipe came out of the Laura Secord Canadian Cookbook, compiled in 1967 as a Centennial project of the Canadian Home Economics Association. The collection amounts to a nation-wide family favourites cookbook with recipes that span centuries and the many cultural influences that are Canada. In the book this recipe is called Signal Hill Gingerbread. My copy of the book came from a second hand bookstore but thankfully the book was reissued last year. If you’re on the lookout for a new “go to” cookbook this is an excellent choice. Of all my mom’s cookbooks, this is the one she has used most often. 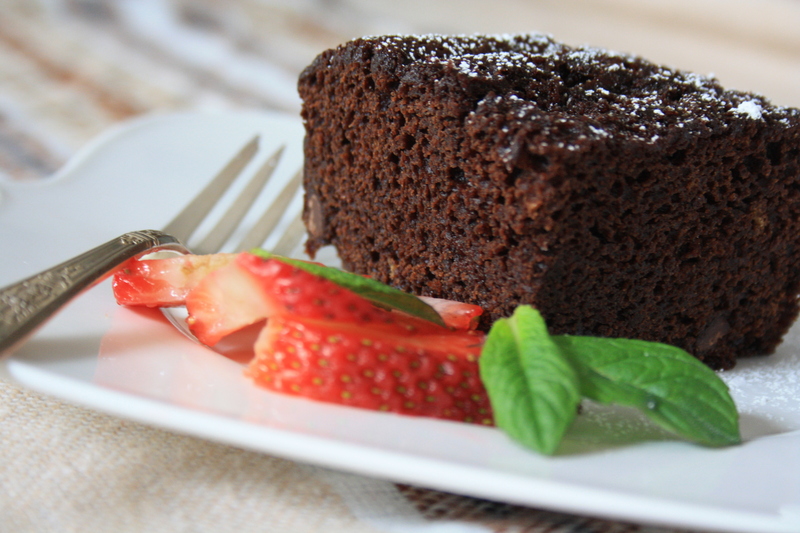 This is about the easiest cake recipe you’ll ever find. You simply toss the egg, butter and molasses in on top of the sifted dry ingredients, mix well then add the boiling water. To make things even easier I line the pan with parchment paper. 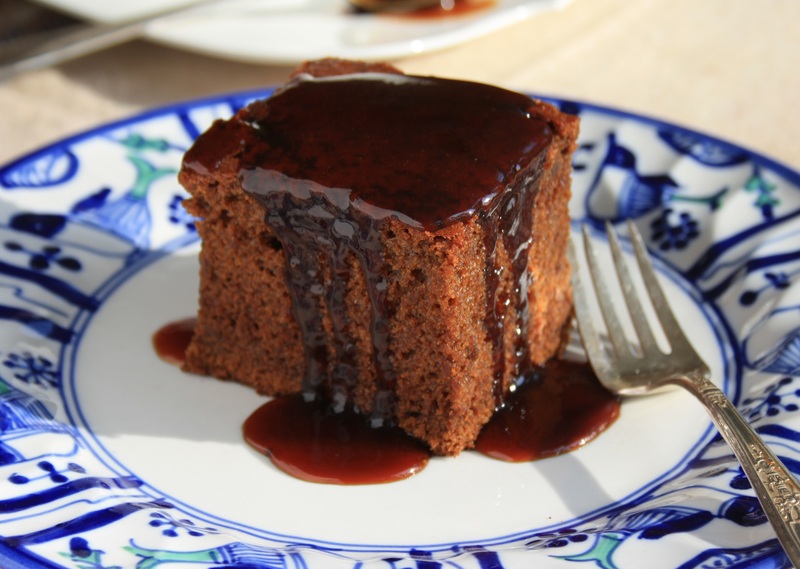 The cake comes out without a hitch and the pan in a cinch to wash.
Eat this cake while it’s warm, with toffee coffee sauce poured over, or vanilla ice cream (or both). It’s also delicious plain and I know others who always eat it with butter. Beat for another two minutes and turn into prepared pan. Bake 50-55 minutes, or until cake springs back when lightly touched. I believe the strokes are counted because I have a gingerbread recipe very much like this one, and the instructions say not to over stir as it will make the cake fall in the middle. Right or wrong? I don’t know!! Makes sense. And it’s a sure sign that the recipe is an oldie when the strokes are counted. I absoutley love this recipie! !I have made 3 so far lol.I have also doubled recipie made in a9x13 pan yummy now have to make one as a birthday cake. We must have similar taste in gingerbread! Great idea to double it…I haven’t ever tried that. Thanks for the suggestion. 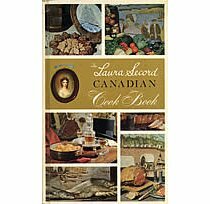 My Laura Secord Canadian Cookbook is the 1977 edition. It has shortening instead of butter. I can’t wait to try this cake. 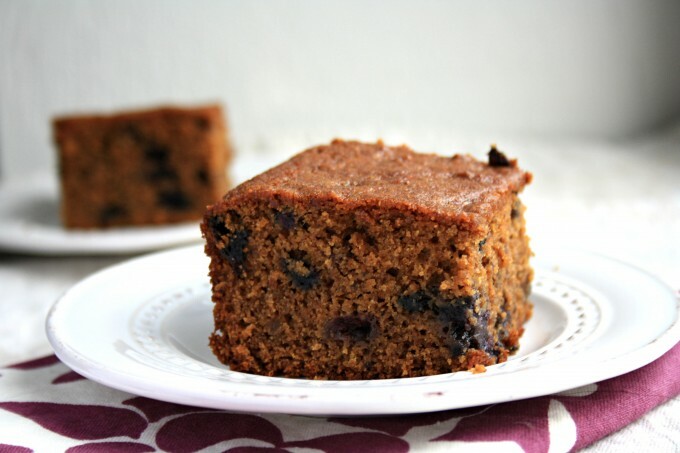 I love any cakes with spices and molasses. I made my first ginger bread the other day It is great and my friends like it. It was sticky on top and bottom were did I go wrong? I lost my recipe for gingerbread many years ago and had to google the recipe and low and behold I found it here. Thanks to Crosby’s molasses. can this be put in a loaf pan? Can a loaf pan be used? It would be worth a try. I’d add ten minutes to the baking time, or toothpick-test for doneness. Is there a recipe for the sauce for this cake? 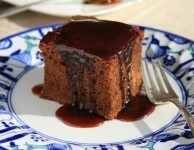 I amgoing to make this recipe today and put away for christmas, A lemon sauce is also very good with gingerbread. Hi Marie, Lemon sauce is such a classic with gingerbread. I don’t have a great recipe for lemon sauce though so must go on the hunt for a good version. we like our ginger bread cake with a lemon sauce. yummyadd lemon juice to water and sugar bring ro a boil thicken with cornstarch, easy . i use real lemon juice in the bottle. Hi Carmen, Lemon sauce is such a great topping for gingerbread. Classic and old fashioned. Yum. I made this recipe last week and it was loved. It was moist and had a lovely “spice” smell. I sprinkled it with sifted icing sugar as I was bringing it to a social gathering. I doubled the recipe and used a oblong pan, lined with parchment to bake it which made it very easy to remove. I think it would bake well in a lined loaf pan as well. Do you use fresh ginger, powdered Ginger or stem Ginger? Hi Kathy, powdered ginger would be perfect! 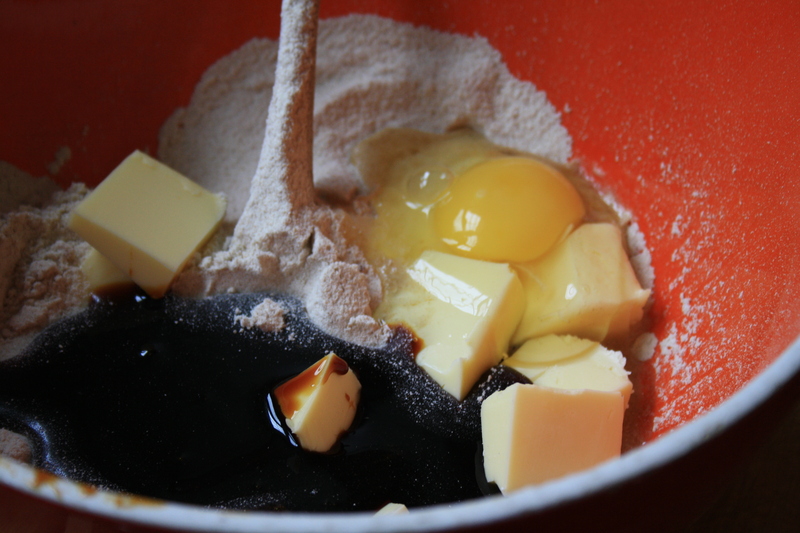 Hi Cathy, here is a recipe for soft molasses cookies http://www.crosbys.com/bear-paws-old-fashioned-soft-molasses-cookies/. Enjoy! We made a similar one from an old cook book I have. It was the first time I had added boiling water to a cake recipe. My recipe did the more traditional cream butter and sugar and gradually add the remaining wet items. I think we overbeat it. It fell a bit in the center. Still very delicious and one we want to try again. We’ll give this version a shot because it makes an 8×8 which is a better size for us. We drizzled powdered-sugar-and-milk icing on top. Hi Emma, the icing sounds like a wonderful addition. Glad that you enjoyed! What fun to find my family’s old recipe here. My grandmother made this, then my mother and Ive been using the same recipe for50 years myself. No one ever knew why it fell in the middle. A few years ago I decided the batter was just too moist so I reduced the water to 3/4 of a cup and that seemed to work. I love it best with plain yogurt on top, sprinkled with cinnamon. Real comfort food for us. My mom made this when I was a kid. We devoured it! Thanks for the memory. Mom always served it with ‘Dream Whip.” I don’t think I knew what real whipping cream tasted like until I moved away from home! I substituted 1/2 cup butter for 1/2 cup unsweetened apple sauce. I also added a little more ginger & 1/4 tsp of cloves to make it a little spicier. Everyone loved it. Thanks for the suggestions. That’s a great way to lower the fat and calories. Anyone know how to convert cups to grams in this recipe. Hi Marg, Each cup of flour (the way I measure) is close to 5 oz, so when I convert ounces to grams I get just shy of 142 g. Hope that helps. Hi Barbera, If you wanted to add raisins to gingerbread I’d choose the Sultanas. They’re softer than Thompson raisins so good for a cake, I think. Hi Valerie, I’d use low to medium with my hand mixer. Excellent cake! I made a mix of 1/2 c butter and 1 c brown sugar, made a gingerbread pear upside down cake with pears, candied ginger, and cherries. Yummy! Hi Margaret, Thanks for the suggestion. Sounds delicious. Hello, all I have is the cooking molasses. How different is that to the Fancy molasses? Could I use the cooking molasses? Hi Marsha, Cooking molasses is a blend of 70% blackstrap molasses and 30% fancy molasses. You could use it in this recipe but the taste would be very strong. Another option would be to use 1/2 cup cooking molasses and 1/4 cup honey in this recipe. I’m a single person. I really miss my wife’s baking and cooking. Never thought I could do this but you make it sound so easy . So I tried your recipe it was delicious. Thanks. Carmen, I am so glad to hear that you tried a baking recipe and were successful. Baking is not very hard, as long as you measure your ingredients properly and that you have good instructions. I hope you venture into other recipes. Thank you for sharing. Happy Holidays! Just pulled it out of the oven and of course I had to cut a corner out while it was still steaming…mmmm delicious! Thank you I followed the recipe not quite as written (I did not do the 300 stirs) and I also added some ground cloves. Esther, it is hard to resist that corner when it come out of the oven, it smells so good. So happy that you enjoyed the gingerbread. Happy Holidays. My aunt Bea gave me this recipe years ago. I have moved twice since then and can’t find the recipe . So glad to find it. She was a great cook. Pattyjune, I am so happy that we posted this recipe and that you saw it. As I have said many times, food gives us such great memories. I have made this a few times now, in two loaf pans (cooking time adjusted to 40 minutes). I find it’s not very gingery, so I recommend tripling the ginger to 1 Tbsp (3 teaspoons) and I also add 2 Tbsp grated fresh ginger. Hi Andrew, Thank you for your suggestions. Using loaf pans is a great idea and the extra dose of ginger sounds delicious. This recipe works perfectly. I got my students to make two different versions of ginger cake and this one is a keeper. Rises evenly, does not crack, moist, excellent crumb, and tastes delicious. I always review comments before making a web recipe, so I took the advice of one and increased the ginger to 1 Tablespoon. Hi James, I’m so happy you discovered the recipe. Credit goes to my mom (via the Laura Secord cookbook) for raising me on this gingerbread.